kirk and i came home from an incredible concert experience with jakob dylan tonight (more to come on this later) to the news that barack obama has secured the democratic nomination for president. this news deserves a hearty woot-woot! i, for one, have been zinging around the house in a euphoric cloud, whooping it up at the top of my lungs, and just generally being a silly face. i'm so stoked! i have hesitated to post political thoughts on this blog in recent months, as i don't want to turn readers off or seem in-your-face or pushy. that would certainly never be my intent. 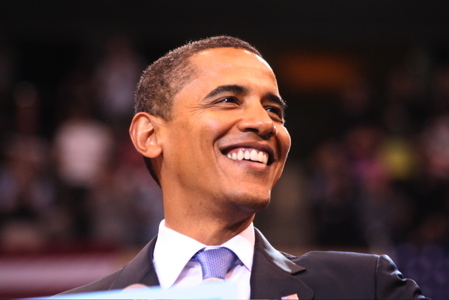 but the truth is, i'm a huge admirer of barack obama, and he has had my vote for many months now. i've followed this primary season with unabated vigor, not for the typical history-making reasons but because i've been reading obama's books, learning who he is, and following his leadership of his campaign with increasing interest. simply put, his ideology and approach have turned my head. for the first time in my life, i truly care what happens. i want to do my part to make a difference. goodness knows, obama is not perfect. i'm not trying to claim that he is (and let's face it, none of the candidates thus far could ever claim to be, either). but he carries himself with great dignity and grace. he treats others, even his worst critics, with the same. he believes we all have a part to play in the making of this nation. and i want someone with his principles and vision leading me, and leading us. so, in short, here are 10 quick reasons barack obama has my vote . . .
he embodies leadership. he has run an exceptional campaign. he has invited the american people into the political process. he is committed to honesty and transparency in washington. he doesn't give easy answers. in fact, he'll give you the hard answers if they are the honest-to-goodness truth. he speaks his convictions. he listens. he's a forward thinker. he's got confidence, verviness, and guts. and, what's more, he has class.